If given a choice, most painters would rather wait until the summer to paint homes, but that doesn’t mean it can’t be done in the winter. Interior areas can be done any time of year, as long as you pay attention to the normal concerns of interior painting: ventilation, dry time, protection, etc. Exterior areas are bit trickier in winter weather, but it’s still possible to slap a few coats of paint on your house to protect it from the cold and wet of the holiday season. As always, the quality of your work will depend on many factors, including your painting equipment and the type of paint you use to cover your surfaces. The same rules that apply to painting exterior surfaces and interior surfaces in the summer still apply here, with a few extra factors you have to take into account. The first factor you’ll have to consider when painting in the winter is the outdoor temperature. Obviously, temperature is more important for exterior projects, but you have to consider the weather even for interior painting tasks because you’ll need to ventilate your interior areas. Colorado winters, aside from periodic snow storms, are relatively dry, which is good for paint. The problem is temperature and temperature fluctuation. The optimal temperature for paint to adhere and dry on a surface depends on the type and brand of the paint, but generally, oil-based paint is best applied to outdoor surfaces when the temperature is between 40 and 90 degrees F. For latex-based paints, the temperature range is between 50 and 80 degrees F. If the temperature is too low, the paint won’t bind together properly, leading to cracking and peeling, not to mention a very unpleasant day painting. 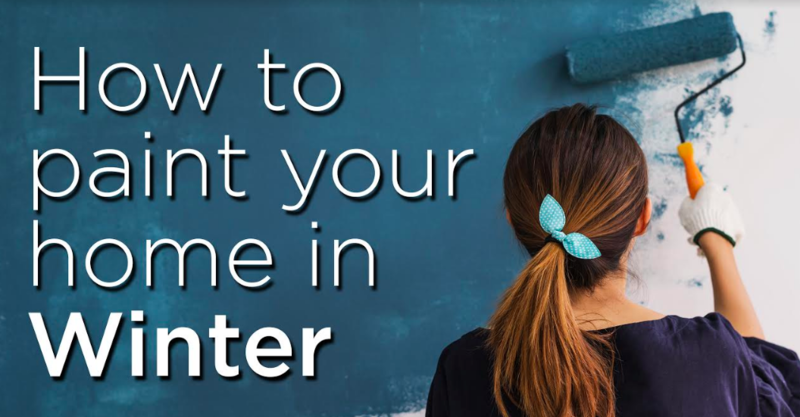 The same temperature rules apply to interior spaces, but it may be more difficult to keep interior temperatures stable while you paint and ventilate your space. Interior painting is more common in the winter than exterior painting, but there are still hazards that affect interior paint and aren’t always easy to avoid. The temperature of the room you’re painting might be cozy and perfect, even on a bitterly cold day, but the most important temperature you should worry about is that of the walls themselves. Your home probably has insulation and multiple layers separating you from the outdoors, but sometimes your wall can be colder than the air in a room. As a rule of thumb, if the temperature outside is below freezing, it won’t be the best time for painting your interior walls. You might have to turn up the heat past the normal levels to warm up the walls enough to apply paint. Another possible interior painting pitfall is humidity. Usually, especially in Colorado, winters have little humidity, but your interior space might carry some moisture in the air. Humidity extends dry times for all paints, so make sure your interior humidity level is low or moderate. It’s possible, even preferred in some instances, to paint your home in winter. To get the best coverage and ensure that your paint is adhering properly, you’ll need to make sure the temperature and humidity is just right.